Habitat destruction due to improper development utilizing dredging and mangrove deforestation remains the single largest threat facing Turneffe Atoll. These destructive and unsustainable practices lead to the loss of critical habitats including sea grass, back reef flats and mangroves. Such development has already destroyed special and unique areas at Turneffe and these practices are absolutely inconsistent with the sustainability of Turneffe Atoll. A significant portion of Turneffe is now privately owned. How private property is developed will be a crucial question going forward. The Marine Reserve offers significant protections, but this alone is not adequate. Protecting this special and unique place will take additional measures and the on-going efforts of Turneffe Atoll Trust. Below is the most recent unsustainable project at Turneffe which entails clear cutting of the mangroves and dredging with a goal of filling this swampy area for development. Note the significant erosion and the pinkish pile of roots in the excavated hole. This project is currently being litigated in Belize. Other unfortunate developments include a large hotel complex which unfortunately dredged one of the most productive flats on Turneffe Atoll for land fill. Turneffe's productive fishery for Caribbean spiny lobster and queen conch is threatened by poor management, over fishing and lack of enforcement. Turneffe's fishermen understand these threats and are now working closely with Turneffe Atoll Trust to ensure that their fishery remains sustainable. 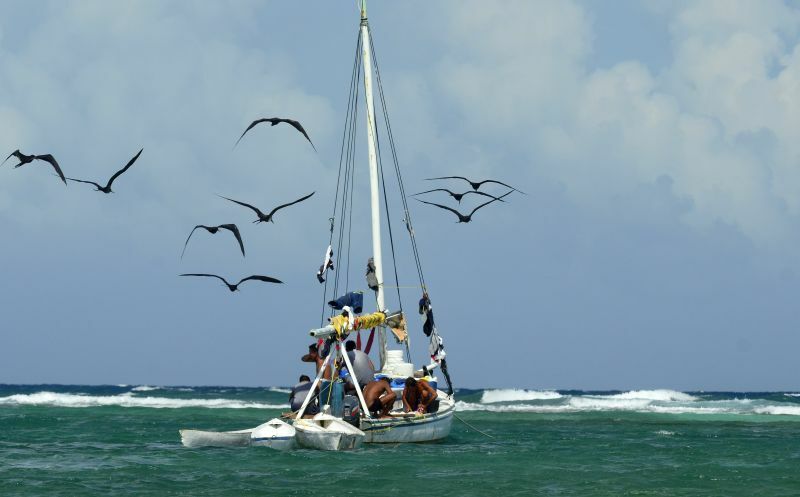 The fishermen have, in fact, joined forces with the ecotourism sector at Turneffe forming an official alliance to advocate for habitat protection. Interventions originated by Turneffe Atoll Trust, and now overseen primarily by the Marine Reserve, are helping, but more needs to be done. Better scientific information about the fishery is required to accurately evaluate management interventions. Principle among the needs is a comprehensive baseline analysis of the spiny lobster fishery associated with a science-based monitoring program. Approximately 90% of Turneffe is low lying land covered by mangroves making it particularly sensitive to by sea rise. At the same time, Turneffe's ecosystems mitigate many of the dire effects of climate change. A major economic function of Turneffe Atoll, for instance, is the protection of Belize City from hurricanes, which economists value at more than $90,000,000 annually. Additionally, mangroves produce significant carbon offsets and essential fisheries habitat. Turneffe is, therefore, threatened by climate change, but also offers environmental assets to help our planet adapt to these changes.